I want to introduce you to Cheryl Nobens (or CA Nobens as she’s known professionally). Cheryl intersected with my world because of Facebook. A friend, who I know personally, shared or commented on Cheryl’s Kickstarter campaign for her book Snow Day! A Story Told in 24 Poem Forms, and me being a bit of a sucker for another artist trying to make it, I pledged some money. While her Kickstarter campaign didn’t succeed, we became “Facebook Friends” and have been interacting off and on ever since. I think she’s a really neat gal, with a wonderful sense of humor, plus I thought her book was so sweet and fun. Ironically, she lives within driving distance to meet for coffee/tea or lunch, yet we haven’t managed to meet in person yet. We’ll have to do that soon! I think the other reason I like Cheryl is she’s as wordy as I am. ;) That’s not a bad thing, right? Every artist has a unique background. I’d love to know a few details of yours, as you’re an author and an illustrator. I suppose if I look back on my life through the lens of your question, I’d have to say that I am a product of a 1950’s/1960’s childhood, most of all. It was such a different time than the one we live in now, especially if you compare the day-to-day activities of kids. Back then, in the village of Hibbing, Minnesota, where I was born and grew up, there was very little, if any, fear of child abduction. Almost every kid’s mom “stayed home” (like the second little piggy? ), and usually kicked her offspring out the door to get them out of her way while she did housework and got a little time for herself. We were on our own for diversion outside, and found endless ways to entertain ourselves, learning to imagine and create our own worlds. I personally purchased a lot of “paint-your-own” ceramic animals with my allowance (riding my Schwinn downtown to the Hobby Hub to buy them), which I painted and then played with all over my back yard, making homes for them in the honeysuckle bushes and my mom’s flower garden. Not very different from what I’m doing now, as a children’s book illustrator, really! Add to this experience the Saturday morning Merry Melodies and other cartoons that we religiously watched while eating bowls of heavily sugared cereal, Matinee Movies dominated by Disney (which we viewed in the riotous company of just about every other kid in town at The Lybba or the State Movie Theater: no videos in the back seat of the minivan for us), and the Little Golden Books which our moms let us pick out on grocery shopping trips to the Red Owl or Piggly Wiggly, and you’ve got the soup where I simmered into the artist I am. Oh, yeah, then I got a degree in Illustration and Graphic Design from the Minneapolis College of Art and Design. What’s your favorite thing about being an author? An illustrator? It’s interesting to me that you ask about the two occupations separately, rather than asking what I like best about being an author/illustrator. The two are very different, for me. Writing is much easier. It’s so much easier to type “a cute pink pig” than it is to create one, visually. And stories really fly to me out of nowhere. Characters talk and do things that I don’t plan. Things pop into my head that strike me as funny as if some corporeal person had said them. I think my feelings about drawing are more pedestrian, probably because I do so much more of it for a living than writing. I have decades of experience changing things that I don’t want to change for a client, of drawing pictures for stories that I don’t love the way I do my own, to temper the creative spark. But when I’m working on an image for one of my own stories, the experience comes close to the pure inspiration of writing. I don’t struggle to get things to look the way they appear in my head (or on a client’s art notes). These are the times that characters fly off of my fingers intact, with no need for revision. Sometimes, they’ve so perfectly alighted on the page that I can’t even trace their facial features to capture that first appearance when I try to do final line art with a darker pencil. I have to scan that first glimpse -- of their eyes, for example (just a couple of dots! How can they hold such a fragile expression? ), adjust the density to match the rest of the line art, and drop it into the final. My favorite thing about being an author/illustrator is writing and drawing. It’s the most fun I ever have. Cover of Snow Day! A Story Told in 24 Poems Forms, written and illustrated by CA Nobens. 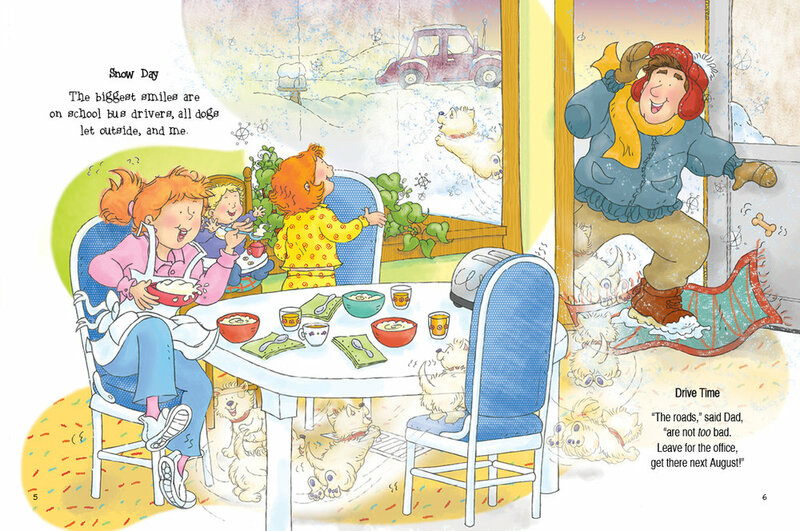 Your latest book, Snow Day! A Story Told in 24 Poem Forms shares the experiences of the little girl Jo as she enjoys a day off from school because of a snow day. What inspired you to write this sweet book? It took awhile for the inspirations for this book to gel into a story. I love winter, and have written many journal entries and poems about the snow and cold, my whole life. I started wondering about different poetry forms (many of which I learned in school) when my daughter was in primary school. Year after year, I would attend Parents Days and wander around reading “poems” the students had written, on bulletin boards. Year after year, they seemed to me to be utterly uninspired. The kids had completely missed the thrill of fitting words together into a pattern that communicated one perfect thought, or one image noticed by one person and burned into one brain. Instead, their (almost always free verse) compositions were usually something like lists of “Things That Are Purple”. It was awful. It seemed to me that they weren’t being taught poetry at all, but rather to subject themselves to a dull and pointless exercise. I found myself wanting to teach them the Brain Game of poetry writing and let them have some fun with it! The immediate inspiration that lead to Snow Day’s story came to me one day when I was out walking in the year’s first snowfall, about a decade ago. Somebody let their dog out of the house and he went deliriously bounding through the white stuff and up to the fence, as I was passing by. He stopped short, we grinned at each other with exactly the same expression and I laughed out loud. This became the haiku “Snow Day”, from my book. I read in your bio that your first book was published in 1979. What advice do you have for up and coming authors? You have to be aware of the business end of being an illustrator, and you have to put some time into it. But making money or becoming known shouldn’t be your goal. It will take too much of your inner energy and pollute your pure creativity. Work at writing (and/or illustrating) because you love it, even though you may never make enough money to be secure in the knowledge that you can pay your bills that month. Really, you might not. Make every effort to keep learning your craft. You can always be better. There is always someone who can teach you something that will make your work soar. Snow Day! is written in poetry form. I know a lot of us (me included) are relative strangers to poetry, so will non-poetry readers enjoy this book, too? Yes, I’m sure you will, because you have had poems like this read to you in your childhood, and they helped to form your love of language. The other day, while watching TV with my 25-year-old daughter, a Mother Goose rhyme was mentioned. Kaija rattled off a couple of lines. I finished it, and then went on to recite half a dozen more nursery rhymes that –- if you’d asked me beforehand –- I wouldn’t have realized that I still remembered. Those patterns are deep in our memories, and you will find a home in my rhymes, maybe remembering a comfortable lap, or the rhythm of a rocking chair. Also, many of the poems in Snow Day! are funny. Who is your book created for? My book was created for me, out of love for poetry and the things that these poems are about. It’s part nostalgia and partly an adventure into things that make kids happy no matter when they’re growing up. I know that all ages enjoy the story, because people keep sending me pictures of themselves reading it, reading it to very young children, and their teenagers reading it. That being said, there is a reality that takes hold in marketing a book and forces distinction. It’s listed on Amazon as best for ages 7-10. Was there a great moment you’ve experienced because of this book? What was it? There have been many. I really couldn’t afford to self-publish this book, and most likely, I’ll never make back my investment. (It’s about as probable that an indie book makes it big as it is that any one adorable teenager who can sing like crazy will become a musical sensation.) But I’m so glad that I published it, because it brought back into my life so many people whom I hadn’t seen or heard from in years, as well as creating opportunities to meet new people that are just great, too. Are there any future projects you’re excited about? I’m trying to find time to work on several. I have half a dozen book dummies in various stages of completion. Stay tuned! How or where can my readers find your books? They’re available online at Amazon and Barnes & Noble (Snow Day! A Story Told in 24 Poem Forms has a “Look Inside” feature on Amazon, where you can see a few sample pages). If you are interested in reading more interviews like Cheryl’s, you can find other inspiring women in the Inspiring Women series here on my blog. Click here for a listing of blog posts. Inspiring Women is a series of interviews with, you guessed it, inspiring women. My idea is to interview women entrepreneurs who have created their own vision and share those interviews to inspire you. The entrepreneurs represent a wide range of businesses.